Home Tags Posts tagged with "arsen avakov"
Three tanks have crossed the eastern Ukrainian border from Russia, Ukraine’s interior minister Aresen Avkov has said. The tanks entered Ukraine along with other armour through a checkpoint controlled by rebels in the Luhansk region, Arsen Avakov said. Ukraine’s army engaged two of them and destroyed part of the column, he said. Russia has rejected Arsen Avakov’s statement as “another fake piece of information”. Meanwhile, Ukrainian President Petro Poroshenko, who was elected last month, and his Russian counterpart Vladimir Putin had a “substantial” conversation by phone on Kiev’s plan of peaceful settlement in the east, Ukraine’s [residency said in a statement. Petro Poroshenko said that it was “unacceptable” for the tanks to be crossing into Ukraine, his press secretary said. Pro-Russian separatists in the Donetsk and Luhansk regions declared independence after holding referendums last month which were deemed illegal by the government in Kiev. Ukraine and the West accuse Russia of supporting and arming the rebels – a claim denied by Moscow. 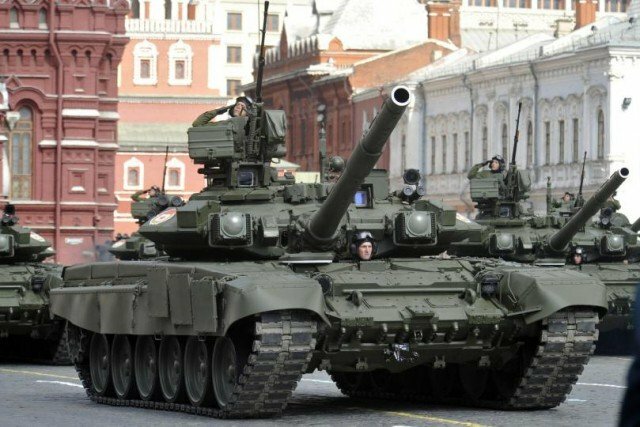 Arsen Avakov said the tanks had crossed the border from Russia along with armoured personnel carriers and artillery pieces in the Dyakove area of Luhansk region, before moving into the neighbouring Donetsk region. There, Ukraine’s interior minister said, the tanks headed for the town of Snizhne on Thursday morning. Two then proceeded to the town of Horlivka and were attacked by government forces. “The fight is under way,” Arsen Avakov said. Unverified video has been posted on YouTube of a battle tank rolling down a street said to be in Snizhne. The footage was shot from a flat overlooking the street. A second clip, also said to have been recorded in Snizhne, shows a similar tank passing a roundabout. A rebel spokesman told Russia’s Ria-Novosti news agency that they were fighting a force of 40 Ukrainian tanks north of the city of Luhansk. The tanks had been stopped at the village of Makarovo, the spokesman said. Ukraine’s Interior Minister Arsen Avakov has announced that security forces have launched an operation against pro-Russian activists who seized a police station in Sloviansk on Saturday. Arsen Avakov wrote on his Facebook page that “all security units” were involved in an “anti-terror operation” in the eastern city of Sloviansk. The US accuses Moscow of inciting the trouble. The Kremlin denies the charge. 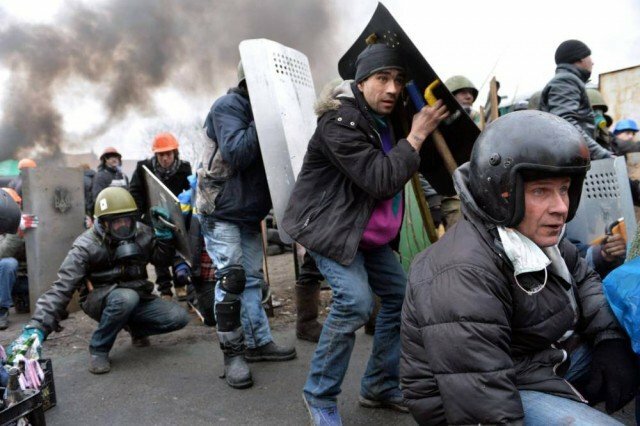 Russia’s Foreign Minister Sergei Lavrov said the Kiev government was “demonstrating its inability to take responsibility for the fate of the country”. The US said there had been a “concerted campaign” by forces with Russian support to undermine the authorities in Kiev. US Secretary of State John Kerry warned of “additional consequences” if Russia failed to make efforts to “de-escalate” and pull its troops back from Ukraine’s border. 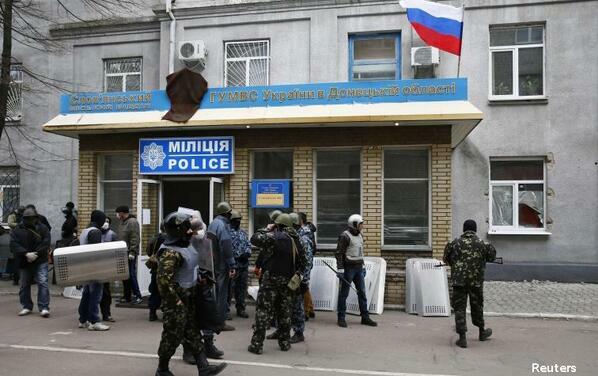 On Saturday, armed men took over police stations and official buildings in Sloviansk and two other eastern towns – Kramatorsk and Druzhkovka. Arsen Avakov labelled the actions a “display of aggression by Russia”. Eastern Ukraine has a large Russian-speaking population and has seen a series of protests since the ousting of Ukraine’s pro-Russian President Viktor Yanukovych in February.